Free Shipping Included! 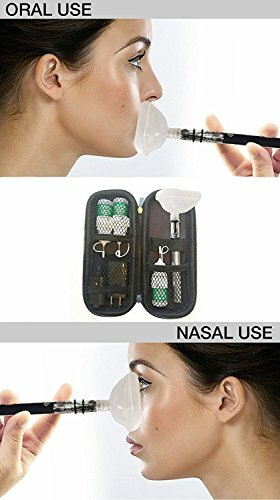 V-Meds - Nano Mist Essential Oil Lung Cleanse Kit by V-Meds - Nano Mist at Blood for Sure. MPN: LCT-1111. Hurry! Limited time offer. Offer valid only while supplies last. Now with easy Top Fill Glass Tank! Requires no extra parts. 60 DAY Money Back Guarantee No Questions Asked. We are that confident! Highly Effective! Now with easy Top Fill Glass Tank! Requires no extra parts. 60 DAY Money Back Guarantee No Questions Asked. We are that confident! Highly Effective! The Nano Mister delivers cool, Menthol Blend, nano-sized droplets directly to the deepest regions of your lungs for Ultra-Fast Onset. The nano-mist penetrates deeper into the lungs than any previous steamer, resulting in fast and effective relief. Contains only pure, natural, and tested ingredients that are all essential oils. Nano-Mist is formulated and produced in the USA. Hardware uses stainless steel and Pyrex glass components. This is a personal steamer not a medical device. Benefits may include: Cools and soothes the throat and nasal passages for better airflow. Penetrates deep into the lungs, opening up the airways. Contains an Expectorant to easily break down and clear out mucus. Suppresses coughing and reduces throat irritation. Contains an Expectorant to mobilize and expel phlegm. Relieves symptoms of bronchitis. Designed and formulated for: Lung conditions, including COPD, Emphysema, Bronchitis, Pneumonia, Allergy, Chronic cough, and more. This will help smokers and former smokers and people suffering from the effects of air pollution. Also relieves suffering from cold or flu symptoms. We have many testimonials with miraculous results. What is Nano Mist? Nano Mist is a concentration of droplets that are measured in nanometers. Droplet size can vary from 50 nanometers to 400 nanometers. These droplets are formed by the battery powered Nano Mist cooling steamer. To give you a perspective of how small that is: an atom is 1/10 to 5/10 of a nanometer. This allows deep penetration into the alveoli region of the lungs and provide soothing relief. Please Read the Operating Instructions to Ensure Proper Delivery of the Ingredients and Maintenance of the Hardware. Patents Pending. If you have any questions about this product by V-Meds - Nano Mist, contact us by completing and submitting the form below. If you are looking for a specif part number, please include it with your message.